Charged with carrying the human race to frontiers distant and challenging, it only makes sense that NASA has had a profound impact on transportation. Since its founding in 1958, NASA’s pioneering research has advanced aeronautics and other modes of transportation as well. Through partnerships with private industry, NASA expertise and technologies developed for space travel are leading to safer, more efficient, and more environmentally friendly transportation on Earth. 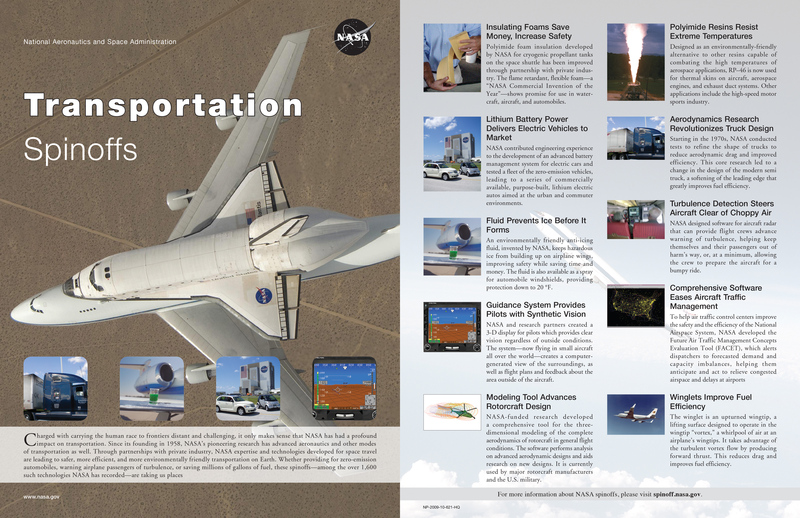 Whether providing for zero-emission automobiles, warning airplane passengers of turbulence, or saving millions of gallons of fuel, these spinoffs—among the over 1,600 such technologies NASA has recorded—are taking us places. Next post It’s a bird! It’s a plane! No...it’s a spaceplane!